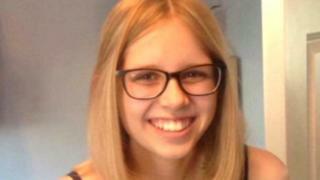 A mental health trust has been called on to take urgent action following the death of a 15-year-old girl who suffered from anorexia. Ellie Long, of Wymondham, Norfolk, was found hanged in her room in 2017. Norfolk coroner Jacqueline Lake has issued a "prevention of future death" report calling for action from Norfolk and Suffolk Foundation Trust (NSFT). The trust said it was meeting the concerns raised over record-keeping and communication. Ellie's mother Nicki Long welcomed the call for more sharing of information between the trust, GPs and schools. Image caption Ellie's mother Nicki, pictured with her partner, told the inquest her family had been "failed"
Ellie's family told an inquest in January the teenager had been "failed by everyone". Mrs Long told Norfolk Coroner's Court that after losing weight, her daughter began to suffer from sleeping problems, which progressed to self-harming and suicidal thoughts. The inquest was told the trust had not been aware of Ellie's historical suicide risk, a care plan had never been completed and there was no crisis plan. The coroner concluded Ellie may not have intended to take her own life. Mrs Lake said there were two key areas where the trust needed to improve and she had not been satisfied with its response so far. She said she was concerned about record-keeping and communication with external agencies such as schools and doctors. "Record-keeping must be second nature to all staff. It is a vital component to the management of risk," she said. "The trust accepts sharing of information is necessary and the trust has said it will remind staff of the importance of sharing information." Mrs Long told the BBC: "The coroner picked up on how important communication is. It really can make a difference. "They all need to be involved. It is something that needs to be changed to prevent future deaths." Diane Hull, chief nurse at the trust, said: "We accept that a prevention of future deaths report was still necessary to address the issues of auditing routine records and external agency communication. "We will provide evidence to assure the coroner that the auditing of routine records will remain a priority for our teams and staff."